Water, soybeans oil, rice wine vinegar, parmesan cheese (pasteurized milk, culture, salt, enzymes), sugar, distilled vinegar, salt, romano cheese (pasteurized milk, cheese cultures, salt, enzymes), dehydrated garlic, egg yolk, anchovy, spices (mustard), modified corn starch, xanthan gum, phosphoric acid, sorbic acid and calcium disodium edta (used to protect quality), corn syrup, natural flavors, yeast extract, lemon juice concentrate, defatted soy flavor, garlic powder, tamarind extract. As part of Unilever, we understand consumers, your guests. We use this knowledge to help chefs and caterers keep up with people’s changing tastes. Created by chefs for chefs. 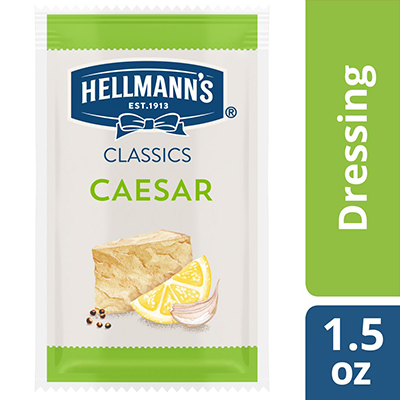 Convenient for Carry out and On-the-Go, this dressing is ideal for mixing with crispy fresh greens or in grain bowls.